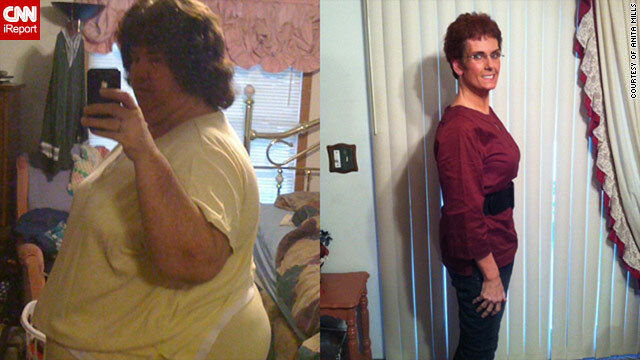 Anita Mills, before and after, losing 232 pounds without crazy diets or extreme exercise trends. (CNN) -- Anita Mills was sitting in the doctor's office with her diabetic mother in Lexington, Kentucky, in 2009. "The doctor was talking to her about options and she wanted to try all of them to stay alive," says Mills. "I realized how brave she was, trying to keep her life. I was 382 pounds and killing myself." She cried in the bathroom of the doctor's office, returned home and took a picture of herself. (The image shown above.) This was a first day of the rest of her life. "I was finally ready and determined. Taking that first picture was my way of making me accountable to this choice to start this journey," says Mills. "I wanted to have it on my phone to look at every day, especially when I was having not a great day." Mills has been overweight for as long as she can remember. She recalls "plumping up" at 5 years old and weighing 200 pounds in junior high. "My family doctor said I needed to get the weight off and if I didn't, I was going to shorten my life," says Mills. "He gave me a piece of paper with four tips to lose weight." Before the epiphany, she kept that piece of paper in her purse for months, even when she would change purses. And every time, she would look at it and think, "I'll start tomorrow." So that's what she did -- or didn't do, really. Almost two years later, Mills has dropped 232 pounds from her body and has trimmed her waist down to 26 inches (a size 6). And she did it all without a trainer. "I've always walked, no matter how hard it was," says Mills. "Then I used Richard Simmons' 'Sweating to the Oldies' because it's low-impact. Now I Zumba, which is like Richard Simmons on speed." She doesn't go crazy with her workouts. She walks about five times a week, sweats to Simmons twice a week and fits Zumba in when she can. Mills can't even eat a full 8 ounces of food anymore -- her stomach has gotten so small -- and she needs to be very picky about what she eats. Her body craves the "good food," so she listens to it. Her latest cravings have been fresh pineapples and mandarin oranges. Don't think that she's a saint either. She still enjoys temptations ... within reason. "I still go out to eat and I still eat junk," says Mills. "My guilty pleasure for the last 8 months [has been] Breyers fat free ice cream -- half cup a night." When she goes out to eat, she orders a meal -- anything she wants -- and asks for a to-go box. It helps with eating healthy food portions, even if she's noshing on her favorite meal: fried chicken fingers and deep fried potato chips. "Out of sight, out of mind," says Mills. "I don't get sick any more from eating too much. You just need to know portion control. I'm accountable for what I put in my body." The hardest thing for Mills was pushing through her plateaus. "I would lose [weight] for about seven days and then nothing for about 10 to 15 days, which was the hardest," she says. But since losing hundreds of pounds, Mills has appeared on the "Rachael Ray Show" for a makeover and talks regularly in schools. "I tell the kids this doesn't just mean weight loss; if you put your mind to anything, nothing can stop you," says Mills. "If you think, 'This is what I'm going to do,' you can get anything done." Mills gives all her credit to her supportive family, especially her husband, Charlie, whom she has been married to for nearly 25 years. She remembers him saying, "I loved her at 382 and I love her now. I love her no matter what. She may look a little different, but she's the same girl." As a family, they are all living healthier lives and dropping the pounds together. But most importantly, Mills wants to be around to take care of her husband, 23- and 19-year-old sons, and elderly parents for as long as she can. And she loves every minute of her hectic, thinner life. "The one thing I can do that I couldn't before is that I can cross my legs and get up and down off the floor," says Mills. She is trying new things that she never thought were possible. She and her husband are going to Gatlinburg, Tennessee, and hopping on a zip line. Mills is also thinking about skydiving sometime in the future. One more thing on her to do list: Ride a roller coaster at Dollywood in Pigeon Forge, Tennessee, which she hasn't been about to do since she was about 8 years old because of her size. "I have a whole new life," says Mills. "It's fabulous to get to this point."